German Daily Writes Climate Summit-Hosting Germany Embarrassing Itself As Its Own Emissions Rise! Browse: Home / 2017 / March / 21 / German Daily Writes Climate Summit-Hosting Germany Embarrassing Itself As Its Own Emissions Rise! Daniel Wetzel of online German daily Die Welt here writes Germany is hosting 1200 experts from 93 countries at its Foreign Affairs Ministry in Berlin to discuss reductions in global “climate gas” emissions and “climate protection”. But there is one small, highly embarrassing problem with the event: host Germany has not been able to reduce its greenhouse gas emissions over the past 8 years, despite tens of billions invested in green energy. Last year German CO2 emissions in fact rose by some 6 million tonnes, from 902 million tonnes in 2015 to 908 million tonnes. Die Welt’s Wetzel reports that the timing of the news “couldn’t be worse” and that it is “embarrassing” for host Germany which was once considered a shining example of how to transition over to a clean energy economy. 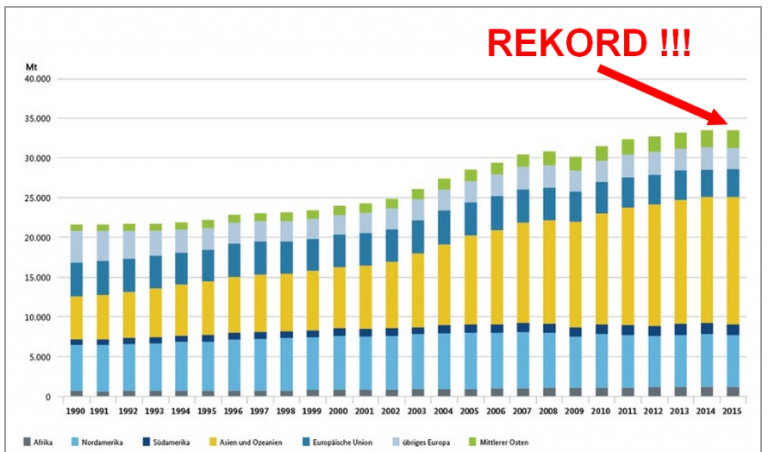 The reality id that most of Germany’s reductions since 1990 resulted from the shutting down the filthy communist-run industries in former East Germany — something that was achieved by modern industry. Very little progress has in fact been made since 2000, when the renewable energy drive began in earnest — despite the now over 1 trillion euros committed thus far. Die Welt’s Wetzel not only writes that Germany’s progress in reductions is embarrassing, but that the country will also surely miss its 2020 reductions target of 40%. Currently Germany has cut reductions by 27.6%, and that has not gone anywhere since 2009. Again, the lion’s share of reductions came from shutting down East German communist-run industry. The Berlin climate summit will be joined by leading German federal ministers from Angela Merkel’s government, such as Foreign Minister Sigmar Gabriel, Economics Minister Brigitte Zypries and Environment Minister Barbara Hendricks, all from Merkel’s coalition SPD socialist partner. There’s no mention if any minister from Merkel’s CDU party will bother attending. Wetzel writes that if the global community wishes to meet its 2050 targets, the rate at which renewable energy gets installed will have to increase 7-fold! As Science Skeptical writes that is likely not going to happen as the planet continues to gallop from one emissions record to another. Global emissions set a new record in 2015. Source: German Office of Environment, UBA. The claim by climate activists that the world can wean itself off fossil fuels is nothing more than a pie-in-the-sky illusion. It is my understanding that the US transition to natural gas has meant that they have been reducing emissions. I wonder what the lesson here is? Yes, the US has reduced by 3% year over year, mainly due to fracking shale gas. Hundreds of billions lost? Hmm … their debt increased to 1.7 trillion dollars in January 2015? Where are we two years later? You really have no idea what is going on, do you. Anyway.. its good the price of fuel for your Mercedes, isn’t it , seb ! And why, when talking about Natural Gas to you link to shale-oil firms. DUMB !!! Has anything changed? Chesapeake Energy lost over $60 billion (who are the investors?) since 2006 … will any future profit compensate for that? Pricey energy independence and CO2 reduction, isn’t it? Poor seb.. why is it that you are ALWAYS WRONG. GROSS IGNORANCE can be the only excuse. Eat your socks, seb…. get more foot in mouth disease. My reply is still in moderation … lots of links to US shale gas profitability. You could say that the past 10 years were an investment in the future and it will some day pay off … but when will that day be? Exactly David… Depopulation and deindustrialization is the goal. CO2 is just a pretext … they’ll gladly add more CO2 to the atmosphere to kill of the nuclear industry..
You have got to be kidding. Ban beans! years ago we were told that Pythagoras banned beans. “Climate gas” was not the concern. Politicians ought to stay out of energy discussions. Controlling emissions doesn’t due much to change the increase in atmospheric CO2. 1. our current government has no real interest in this topic. 3. Germany is exporting massive amounts of electricity (the CO2 produced here is replacing sources in other countries). In the real world, Germany has dramatically changed its electricity production and has also completely changed rules for new houses. These basically passive houses will save a ton of CO2 over the next decades. The global emission graph is totally absurd. Just look at the giant red “record” sign over a bar that is basically not different from the next one. It is inevitable that German CO2 emissions will not decrease in the foreseeable future due to Germany’s policy on migration. 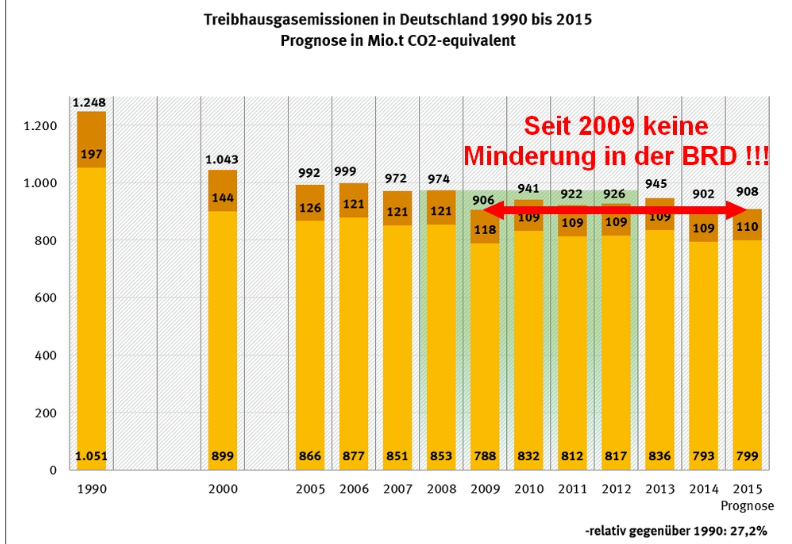 Germany emits about 10mt of CO2 per capita, thus by introducing say 1 million migrants, Germany’s CO2 emissions will increase up to about 10 million mt as these new migrants are housed, buy cars, increase traffic jams, require more buses/trains/more demands on public transport, require schools for their childrens, more shops, hospitals, more farmed products, electricity/gas for heating, cooling etc. Unless these new migrants are forced to go without the life style enjoyed by Germans which deprivation would lead to much social unrest, it is inevitable that Germany will niot be reducing its CO2 emissions any time soon, no matter how many windmills it builds, roof top solar panels are installed. To add to the problem, Germany is phasing out nuclear which is the only base load non CO2 emitting power source. It is great to have sceptics who are this optimistic about our immigration policy1 THANKS! In the real world, even a million people will not change our CO2 production by a lot. The important number here is CO2/GDP. Germany would in a perfect situation, if everyone of that one million would reach German standards soon and if they started to buy cars in mass. In the real world, they would still only change the CO2 output by 1%, (9 mio t in the graph above), which would be nothing but noise. That’s basically what Richard said. 1% bigger population equals 1% higher CO2 output if nothing else changes. You mentioned the massive exports (around 10% of our produced electricity was exported to neighboring countries) and that might be a far bigger reason for increases in CO2 output. Traffic didn’t really increase and certainly hasn’t gotten less efficient over the years. Let’s see what happens shall we. I know you know absolutely nothing about power grid stability, and I know you really totally on fossil fuels to provide that stability (marginal now in Germany). But as coal is forced out by subsidies and feed in mandates from unreliables, there is only one thing that can happen. So far you still have enough proper supply to control the grid. But please keep destroying that real electricity supply with stupid feed-in and tariff rules. I give it a couple of year. I hope you are one of the regions hit hard. How’s the Merc.. still running on fossil fuel ? Coal power all over the world is in dramatic decline. You caqn feel the panic in the coal spokesmans words, trying to defend his power source while 50% of planned coal, power plants got cancelled last year. Atomausstieg also did not help Germany, strange as Germany had no tsumami hazard for their nuclear facilities.